For years our grandmothers have wowed us with warm homemade apple pie, Krista and I are not grandmothers, but we decided we had to start some time, and now was just fine. Krista wanted to make an apple pie for a friend’s birthday and found a great recipe for apple-pear pie. She came over to the house and we began. First came the filling, peeling apples and pears, slicing them ever so thin, and mixing them with wonderful ingredients cinnamon, brown sugar, and butter. Finally you cannot have pie without the crust. For this endeavor we opted for a simple approach using a purchased pre-made pie dough. We laid it out in a clay dish and then added the filling, covered that with the top shell and crinkled the edges. The result was a delicate, sweet, flakey pie that had all the spirit and flavor of the classic apple pie. The pears I noticed added a lightness to the filling which was a delight and made each bite incredibly succulent. This recipe will definitely be repeated in our future pie baking. I believe our grandmothers would have been proud. 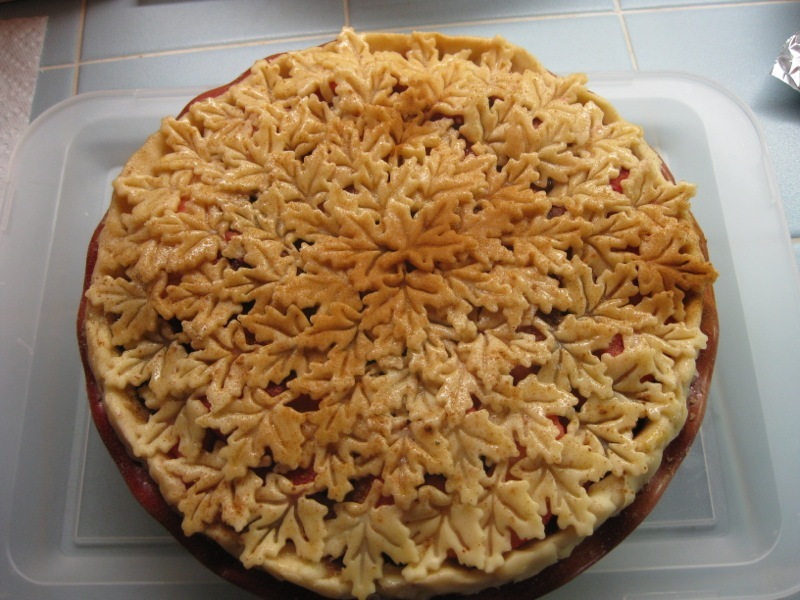 The picture below is that same delicious pie made for Thanksgiving ’09, with the addition of blackberries and a little fun with dough cutters. My husband and I have been married 7 years. Somehow, in all this time, I have yet to cook a meal for my in-laws. Now, I dearly love my in-laws. They are without doubt a charming, warm and wonderful couple and I feel quite lucky to be included in their lovely family. So when my husband announced they would be coming to dinner on my day off, Monday, I was quite eager to make as tasty a dinner as I could muster that wasn’t hell to pull off. So I chose to roast a pork tenderloin, something I also had yet to do. To accompany this lean cut of meat I added an aromatic mixture of fresh herbs and an outer layer of rich pancetta. This helped to keep the roast extremely moist, as pork is very easy to dry out, and added a ton of flavor. My little house smelled bacony-good all evening!